Sun Coach by Oriflame is a must-have during the holiday period. It will help you get the most out of the summer weather at the same time as it helps you protect yourself from the hazards of direct exposure to sunlight. 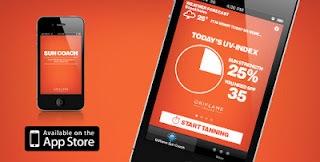 Sun Coach by Oriflame is a free iPhone app that reads your location and, based on the current weather, temperature and UV index it will recommend which sunscreen you should use. You then confirm your skin complexion and which SPF you will apply. Based on all the information supplied and retrieved within the app, a timer will tell you when to get out of the sun! In addition to monitoring local weather conditions and other factors that determine how much time you can spend in the sun, Sun Coach by Oriflame also provides you with useful tips related to sunbathing. It will give you valuable information on actions to take before, during and after spending time in the sun – all designed to help you get the most out of your well-deserved holidays and weekends spent outside in the beautiful weather. Download it from the Appstore today!